Ziggy Baby's 100% Cotton Muslin Baby Bib Burp Cloths are not only super absorbent and breathable, but fashionable too. Made of 100% high quality muslin cotton in a stylish Grey and White Chevron, Arrow, Cross pattern, our Neutral Grey Collection baby burp cloths easily transform into baby bibs with a simple snap. 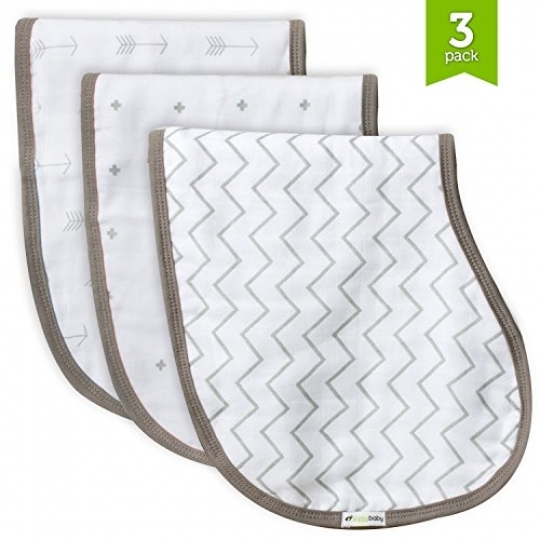 The functional 24 x 9.5 inch burp clothes provide generous coverage for newborns, infants, large babies, and even toddlers so you can get years of use without peeling or fraying. With a trendy & stylish design, our burp cloth set has a contoured shape to fit comfortably over your shoulder while the absorbent, 4-ply muslin cotton protects your clothes from baby drool and spit up. These versatile, unisex baby cloth bibs and burp cloths make the perfect boy, girl baby shower gift. You can complete your stylish nursery sets by adding matching Muslin Swaddle Blankets to your cart. THE ZIGGY BABY PROMISE – At Ziggy Baby, we pride ourselves on superior customer service. We have a No Questions Asked No Hassle No Problem Refund Policy so you can Add To Your Cart with confidence and checkout without worry. You'll be glad you did, we promise.